Image credit: Flight of the Navigator, 1986. As kids across America flock to see what passes for entertaining children’s movies these days, I can’t help but reminisce about some of my own summer favorites from childhood. All month long on Cinema Sips, I’ll be featuring kids movies that are near and dear to my heart, along with a cocktail pairing to make it just that much more fun. Because let’s admit, as much as we tell kids to cherish their youth, sometimes it’s pretty great to be an adult. Kicking things off is that Fourth of July classic, Flight of the Navigator (DVD/Download). Oh how my brother and I loved to shout “compliance!” at each other in the late 1980’s, in that weird pseudo Pee-wee Herman voice. The story of a boy who gets abducted by aliens, then returned 8 years later having not aged a day, is the stuff of bad sci-fi, but somehow it works here. Maybe it’s because of the Disney Soarin’ music, or the creepy puppets, or just the bad 80’s hair (ahem Sarah Jessica Parker). But whatever it is, I loved it then and my feelings have not faded. If anything, my appreciation for Twisted Sister has only deepened. Inexplicably, the 1980’s technology in this film includes the R.A.L.F., or Robotic Assistant Labor Facilitator. It’s basically a big cardboard box that delivers papers and food. A prehistoric Amazon drone if you will. This acronym, and the movie’s Florida setting inspired my cocktail this week, the R.A.L.F. (or, Rum And Lime Flip). Combine all ingredients in a cocktail shaker filled with ice. Shake vigorously until chilled, and the egg has emulsified. Strain into a coupe glass. No, your eyes do not deceive you- that is not a time-traveling Bruiser, come to visit us in 2016. In fact it’s my look-a-like dog Peaches, who was very excited to see her doppelgänger on screen this week. She thought the frisbee scene was aces, but she’s still not sure about the scary giant eyeball on the ship. Really, neither am I. Cheers, and Happy Fourth of July! Posted in Children's, Sci Fi and tagged Aussie dog, Border Collie, Chris Bathgate Sculpture, Compliance, Flight of the Navigator, Fourth of July movie, movie cocktail, R.A.L.F., Rum Lime Flip cocktail, Sarah Jessica Parker. Bookmark the permalink. A recent trip to Las Vegas has prompted me to re-watch some of the better movies set in Sin City, including Casino, Oceans Eleven, The Hangover, 21, and my personal favorite (and this week’s Cinema Sips pick), Honeymoon in Vegas (DVD/Download). This film gives a bit of an outdated view of The Strip (prompting my mother and I both to wonder- Is Bally’s even there anymore?) but even without Cirque du Soleil ads and trendy restaurants, it’s still a delightful romp about the dangers of gambling, the dry heat of the desert, and the timeless hilarity of Elvis impersonators. 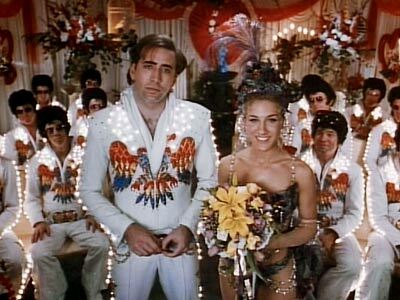 Honeymoon In Vegas is one of the better films to come out of Nicholas Cage’s weird-n-wild oeuvre, only because in this one, his intense, slightly insane mannerisms really work for the character. He plays private investigator Jack Singer, a man terrified of marriage who nevertheless proposes to his longtime girlfriend Betsy (played by Sarah Jessica Parker). They run off to Vegas to elope, but before they can get to the chapel, he enters a rigged poker game set up by mobster Tommy Korman (played by James Caan). Of course Jack loses, and instead of paying money that he doesn’t have, he agrees to let his girlfriend spend the weekend with the mobster. James Caan takes SJP to Hawaii while Nicholas Cages runs around like a chicken with its head cut off, and hijinks ensue. Some great cameos to look for are Pat Morita (aka Mr. Miyagi) as the Hawaiian taxi driver, as well as little baby Bruno Mars singing his heart out as a child Elvis impersonator. The story is ridiculous, but it always gets me excited for Las Vegas, and hopeful that one day I’ll actually spot an Indian Elvis wearing a turban. It’s like seeing a Yeti. On the cocktail front, I had the good fortune of attending some great Texas Tiki Week events last week. I always look forward to the last week of June because it means Austin becomes a sea of rum drinks in commemorative tiki glasses. How appropriate then to mix up a classic tiki drink to enjoy while watching Sarah Jessica Parker flaunt her perfect body on the beaches of Hawaii. When watching Honeymoon in Vegas, I recommend drinking a Mai Tai. Pour all of the ingredients except the dark rum into a shaker filled with ice cubes. Shake well, then strain into an old-fashioned glass (or Tiki mug if you have it) half filled with ice. Top with more chipped ice, then add the dark rum. Garnish with a cherry, lime, and a drink umbrella. As much as I love Vegas, my favorite parts of this film are definitely the Hawaii scenes. Watching Nicholas Cage shout Kapa’aa into a pay phone just makes my year. And let’s not forget the South Pacific sing-along with Peter Boyle’s island chief. As a child I often wondered how the parakeet brandy they drink was made- crushed feathers? Beaks? Even knowing the actual alcohol mix now, it’s still not much more appetizing. So I would say, stick with the Mai Tai, and never forget- if you’re about to jump out of an airplane dressed as Elvis, it’s yellow, then red. Kabluna, and Cheers! Posted in Comedies and tagged Bruno Mars, Flying Elvis, Honeymoon in Vegas, James Caan, Kapa'aa, Mai Tai recipe, Nicholas Cage, Pat Morita, Peter Boyle, Sarah Jessica Parker, Texas Tiki Week, Vegas Movies. Bookmark the permalink.